Mr. Clean Car Wash is dedicated to the maintenance of your vehicle. Whether it’s maintaining the showroom shine of your exterior, or detailing and freshening up the interior, we’re here for you and your car. And with a host of wash packages ranging from a quick shine to an all over detail, there’s a Mr. Clean Car Wash package for everyone. Now you can get high-quality detailing in a fraction of the time it takes at most auto detail shops. Mr. Clean Car Wash offers a large selection of custom Express Detail services, each of which can be completed in about 30 minutes. Pick one or more today and a different service on your next visit. 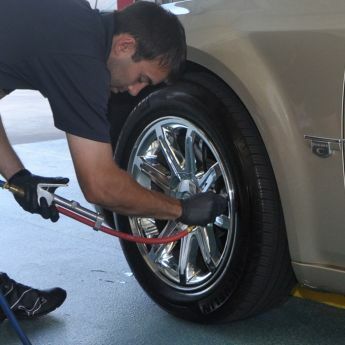 It is a more convenient way to keep your car looking great and your schedule running smoothly. It’s our top-of-the-line shine package! Super Shine combines the detailing services below into one fantastic combo for great savings and an incredible shine inside and out! 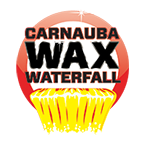 Applied with an orbital, our wax cleans off dirt, minerals and light oxidation. This service helps give a dramatic improvement to the clear coat and protects for up to 3 months. STEP 1: Polish is applied to remove old wax buildup, minor oxidation and surface contaminant. STEP 2: Synthetic Wax is applied to produce a deep, lasting shine to protect your clear-coat finish from UV damage. A specially formulated polish is sprayed onto the painted surfaces of a vehicle before it goes through a whole car polisher to enhance the shine in about 10 additional minutes. Can only be done on vehicles with non-oxidized paint. Helps keep the shine in between waxes. Advanced surface preparation for waxing. Hand-applied service removes oxidation, overspray, scuffs and other contaminants. Carpets are gently scrubbed with a cleaning solution with special attention to the high traffic areas. 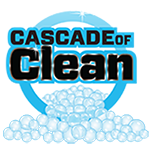 Helps keep your carpet and mats from getting stained and prematurely worn by quick, yet thorough cleaning. Spot cleaning available. Mr. Clean Car Wash uses a special solution for cloth and special tanners for leather. First, seats are gently cleaned with special care given to high-traffic areas. For leather, a leather conditioner is applied that helps keep leather supple and prevents deterioration. The final step is to lightly buff by hand. Mr. Clean Car Wash recommends this service be performed once a year for average-use vehicles. First, all interior hard surfaces are scrubbed with a cleaning solution and a soft brush to remove dirt and stains. Once clean, a vinyl dressing is applied. This helps keep interior hard surfaces protected and looking great. 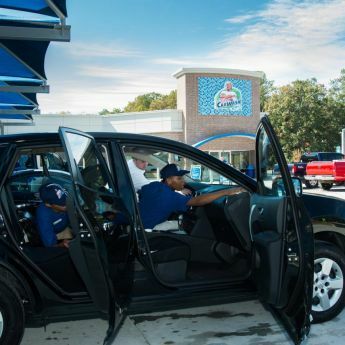 There’s no need to spend all day driving to multiple locations to get a great car wash and a quick, high-quality oil change anymore. Mr. Clean Car Wash provides such a robust selection of services for your car, there’s no reason to go anywhere else! 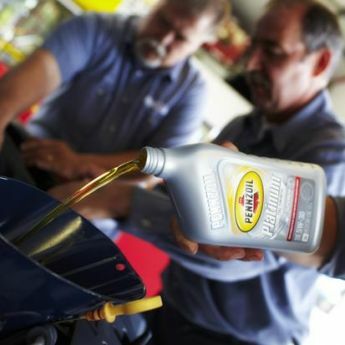 Every oil and lube service includes the 15-Point Check to ensure your car is performing in top shape. Plus, all regularly priced oil change purchases include a FREE Pro Interior & Exterior Wash (other offers and promotions may apply)! At Mr. Clean Carwash & Oil Change PLUS, there are never any shop or oil disposal fees. Services not available at every location or on every vehicle; includes up to 5 quarts of oil and standard oil filter (some makes/models may have addtional charges based on oil capacity and/or filter style). Click here to find a location near you for details. 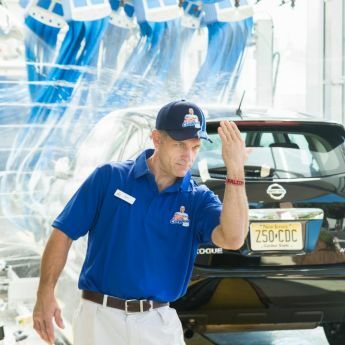 Every Mr. Clean Car Wash Oil Change includes a complimentary 15 Point Inspection*. Mr. Clean Carwash & Oil Change Plus can help keep your car running better with the standard periodic services available in our Oil Change Centers. Improve gas mileage and performance by allowing us to change your air filter and performing the fuel system services available. 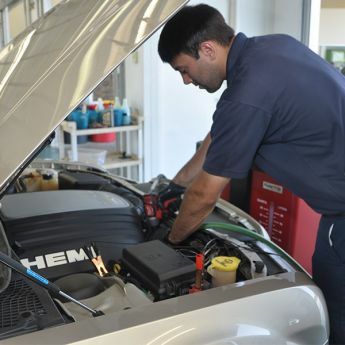 Protect your engine and transmission from the extreme weather changes with our radiator or transmission service. Not all services available at every location or for every vehicle. Click here to find a location near you for details. Required annual inspection for 96 or newer vehicles In GA.